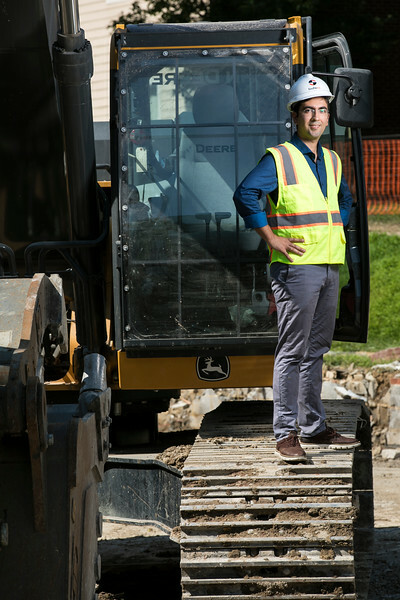 When Mason Engineering doctoral student Pouya Gholizadeh was walking near his apartment complex in Fairfax recently, he was alarmed to see a construction employee on the roof of a building working without a hard hat or any safety system that would protect him if he fell. Gholizadeh knew this was an accident waiting to happen, and he has the research to back it up. As a PhD student in civil engineering, he is reviewing federal government data to determine the causes of accidents and fatalities on construction sites. “The safety of construction workers is unfortunately not the best,” he says. Gholizadeh earned a BS in architectural engineering and an MS in project and construction management in Iran. He went on to get an MS in construction management with a minor in statistics from the University of Nebraska-Lincoln (UNL). He was working on his PhD with Behzad Esmaeli at UNL when Esmaeli decided to take a job as an assistant professor with Mason’s Sid and Reva Dewberry Department of Civil, Environmental, and Infrastructure Engineering. After he graduates in May 2019, Gholizadeh would like to continue to do research and teach at the college level.